CCTV catches the culprit in action. THE WATERFORD branch of The Order of Malta was broken into last Tuesday, March 26, resulting in a significant amount of damage to the building and their equipment. According to Waterford Gardaí, the alarm on the premises, which is located on Bath Street, was activated at approximately 00:45 and on first inspection, there was nothing major stolen but the damage was considerable. According to The Order of Malta, one of their ambulances, a 2010 VW Transporter, had a reversing camera forcibly removed from the back, damaging wiring and bodywork. 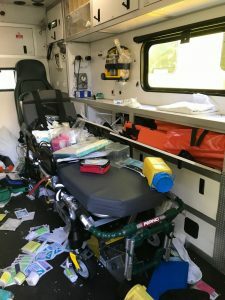 A second ambulance received a broken window and its fire extinguisher removed, which was later used to smash a window at the front of the building. 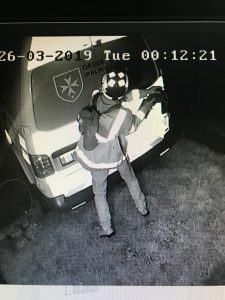 The intruder spent over 40 minutes in the third ambulance, ripping a camera monitor screen from its bracket, breaking a radio console bracket and causing thousands of euro worth of damage during a prolonged ransacking. Clive says that the break in last week was not an isolated incident. Some of the damage to the Order of Malta ambulances, which was sustained during a break in on Tuesday, March 26. Waterford Gardaí have confirmed that a male has been arrested, and they are not looking for anyone else in relation to the crime. “As officer in charge of the Waterford unit I would like to thank the Gardai for their quick response to the alarm call and also for their speedy arrest of the person suspected of being involved in this incident,” Clive said.